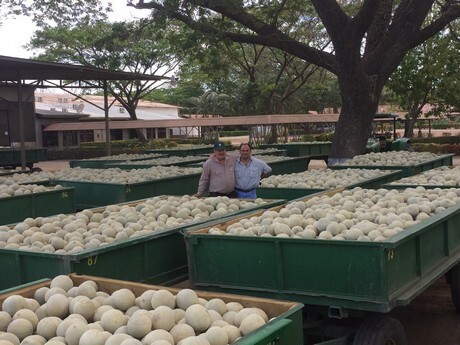 Costa Rica News – Costa Rica’s melon season runs from January to April and the company Exporpack is already starting to prepare for it. “We start planting at the nursery in mid-October and the first plants are transplanted in early November to be able to have the production in the first or second week of January. We are closing the deals with customers and shipping firms so that when we start in two months, everything will be ready,” explains Gustavo Estrada, operations manager of Exporpack. This season, the company will launch a new melon variety of its own development called Tiko. Estrada describes it as “a small melon, weighing 1.25 kg, with a delicious, unique and different flavour, a very good level of sugar (up to 17 degrees Brix), a salmon colour, ovoid shape and oriental appearance. We already made some semi-commercial shipments last year and have set up a programme with customers in Europe.” The producer expects good demand for melons, both of this variety and others. Exporpack produces and exports melons of different varieties, including Cantaloupe, which represents three-quarters of the production; a hybrid Charentais called Agustino (which according to the producer is one of the first long-life Charantais) and Galia, from which they grow another hybrid called Tenorio. It also produces sugar cane on a smaller scale and sells fruit from other producers under its brand Delicia. The company has managed to export up to 1,500 containers of Cantaloupe melons per season at its peak, three years ago. At present, it produces and exports between 1,200 and 1,300 containers per season. Exporpack allocates 40% of its production to the United States and the remaining 60% to other markets in Europe, including the UK, the Netherlands, Italy and Scandinavia. “The United States received only Cantaloupe. In Europe, we ship all other varieties, including those of other producers, such as yellow and Piel de Sapo melons and watermelons, both with seeds and seedless,” states the trader. With the production of these third producers, of about 700 containers, Exportpack’s total exports reach about 2,000 containers per season. The company celebrated its 30th anniversary on 16 June. Agustín José Penón, grandson of the founder, has been managing it for 20 years and has turned it into the largest melon company in Costa Rica, according to Estrada, who considers it an achievement to last for 30 years in such a competitive sector, in addition to other major achievements of the company, such as its many certifications. “20 years ago, most sales were made to the United States, but there was a gradual move towards the European market, where we have a production with more specific varieties. In these years, we have gone from melons with a short shelf life to long-life ones which allow for longer transit times,” explains the exporter. “During the season, we hire about 900 people and our acreage consists of 1,200 hectares of melons and 800 hectares of sugar cane.” Estrada acknowledges that the company is not increasing its production area; however, it has increased its efficiency and improved its processes striving for world-class quality levels. He affirms that they are now just where they want to be, because they do not want to saturate the market. “All our production is contracted beforehand, so that when the containers arrive at their destination, we know who is going to buy them.” The company is a direct supplier of Wal-Mart supermarkets in the US and of Tesco in the UK. The company has a policy of environmental sustainability which consists of several programmes, such as the creation of 100 hectare areas of forest reserve where they have built wetlands. It also has certifications such as GlobalGAP, Tesco Nurture, Field to Fork, Wal-Mart Food Safety and Social Responsibility, SMETA and Carbon Neutrality PAS 2060. According to the producer, Exporpack is the world’s first and only company devoted to the production of melons that has the PAS 2060 certification.